I had a few friends over on the weekend and we did a small little pot-luck with our DIY projects. Sienna brought her mango salsa + booze, Kristen came through with the champagne for mimosas and a cheese platter and I whipped up tostones with this crisp granny apple smith salsa. You guyssss, Sheena shouldn’t have even ordered us lunch because we dogged all of our apps before we could even start on our coasters! What I loved about the food spread that we had was that it was simple, delicious and just right for our little get together. What’s even better than that?! The salsa I made was healthy and still something anyone could enjoy no matter the diet or eating lifestyle. If you’re vegan, on a paleo diet, Whole 30 or just cutting out those store brought salsa, this is right for you. 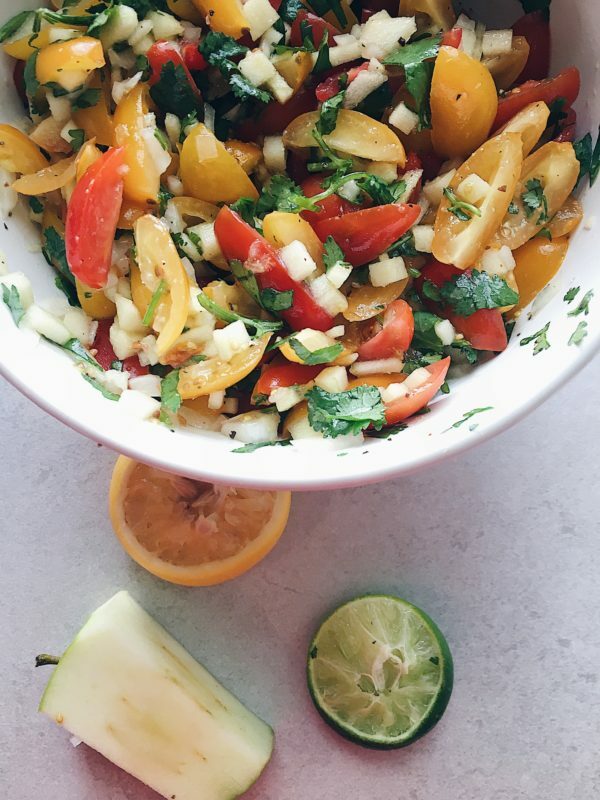 The granny smith apple added a crunch to the salsa and a bit of tartness that made this my go-to spring salsa. You can replace this apple with any other apple that you want to change and continue with the same recipe. Can we say, SPRING HERE WE COME! *Linked in this post: DIY coasters + baked tostones recipe*. When you want a tangy munchy for an app or a pot luck with friends, this salsa is just right! 1 cup cherry tomatoes mixed yellow & red, cut in half - twice. 1 tspn seasonings each - pink Himalayan salt, cracked black pepper & garlic. Combine your ingredients in a large bowl and mix them together. Before letting it settle and getting everything to mend together, taste to make sure it's to your liking. After 25-30 minutes (you can even leave it for 2-3 hours to pick up the flavors), serve!